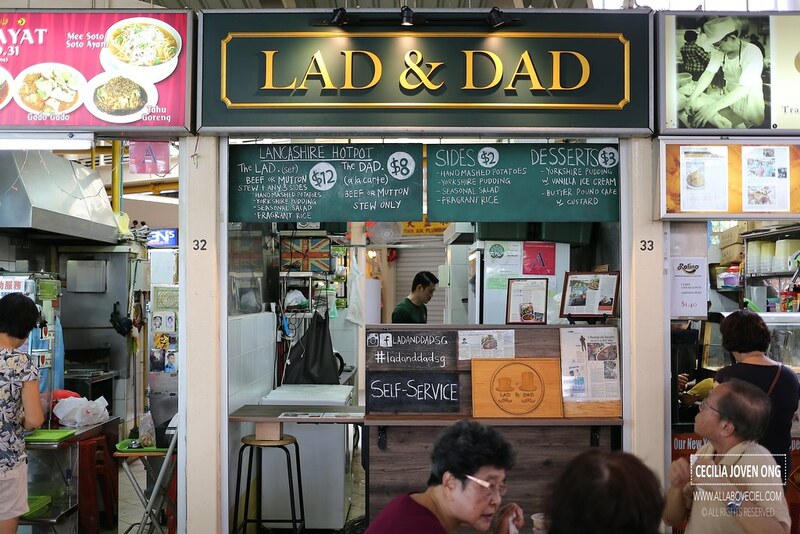 Keith Loh, the 'Lad' used to study then worked in London before coming back to Singapore and started this hawker stall with Desmond Koh, his dad, they aim to serve affordable British-inspired classics with a local twist as comfort food. I was there on a Sunday slightly after 12 pm. Keith was there, manning the stall all by himself. I was told that if i want to have the Yorkshire Pudding, i would have to come back at 12.30 pm as they were not ready yet. I was given the choice to have the other side dishes or come back much later which i did. 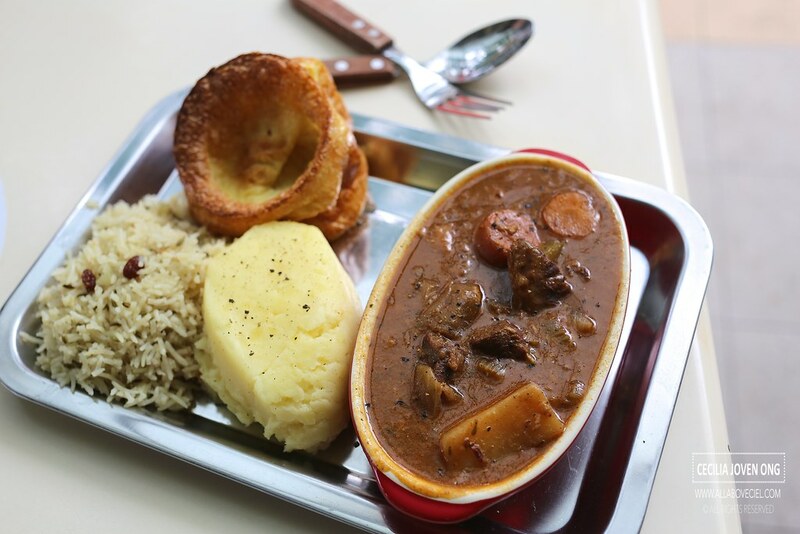 Their menu is pretty limited, the main dish is the Lancashire Hotpot, you could choose between Beef and Mutton at $8 as a-la-crate dish or $12.00 as a set that is served with 3 side dishes. 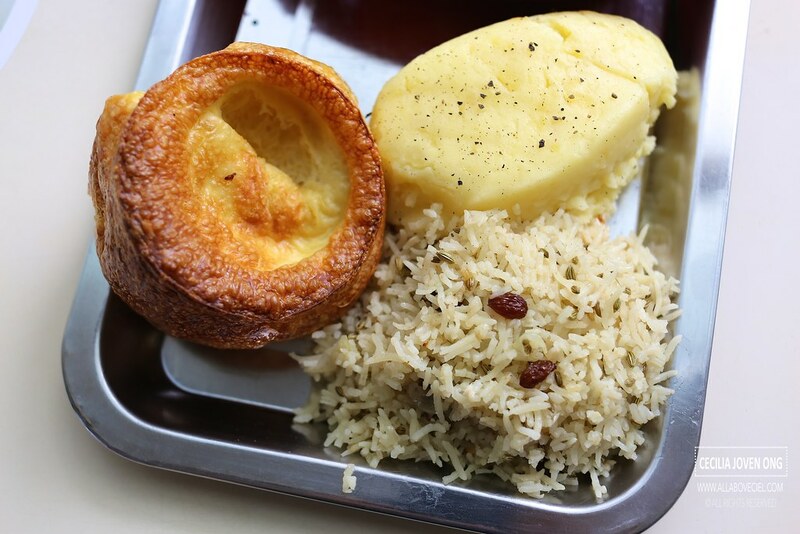 In total, there are 4 side dishes to choose from, mainly Hand-mashed Potato, Seasonal Salad, Fragrant Rice and Yorkshire Pudding baked from scratch, each serving is at $2. 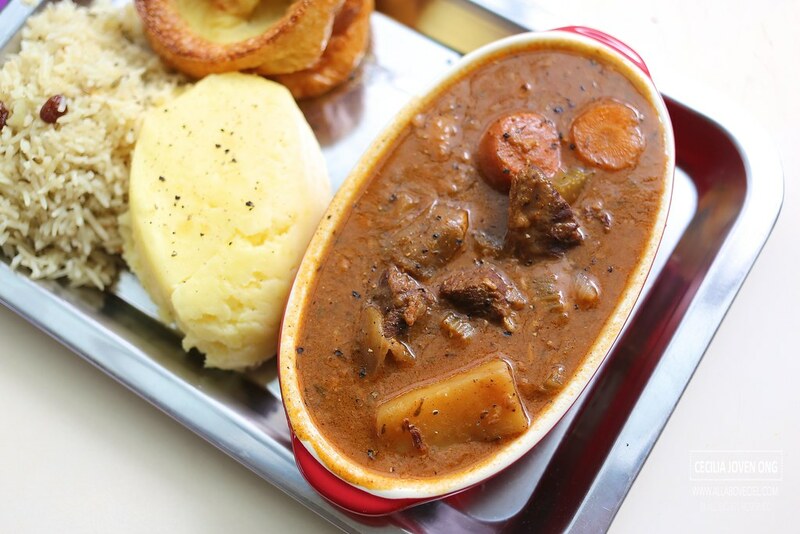 Their version of Lancashire Hotpot is slightly different from those that is done traditionally which is usually baked in the oven. Instead, they slow-cooked for hours in a metal pot added with celery, carrot and potato. I ordered the Beef Stew set and i was asked to choose 3 side dishes. I asked for a recommendation and Keith suggested i should go with their Hand-mashed Potato, Fragrant Rice and their signature Yorkshire Pudding. After done with payment, i was asked to come back in 5 minutes to collect it. Before it was due, i spotted Keith waving at me from far. When collecting it, i asked him, 'How is the business so far?'. I asked as i realised i was their first customer at 12.30 pm on a Sunday. Keith said, "We have been around for almost a year and the business is picking up but is a bit quiet lately. It is even so for some of those popular stalls like Ah Seng Duck Rice, their queue is much shorter now." 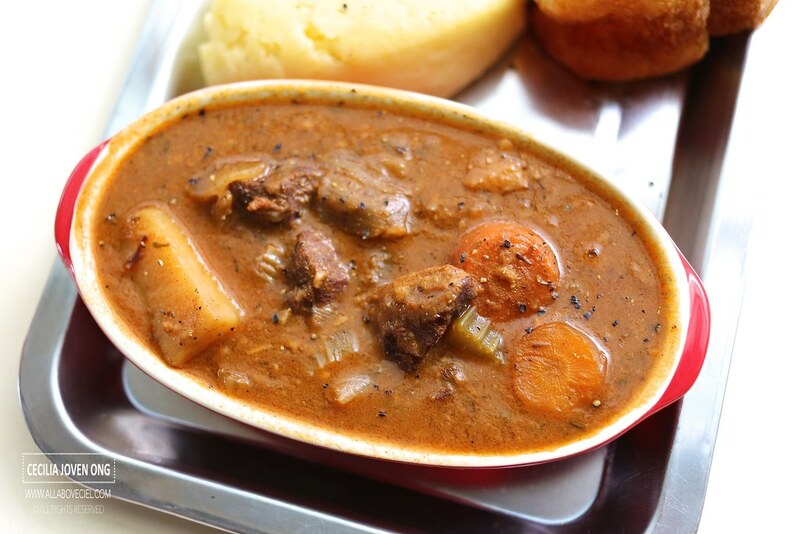 They serve it using a metal tray with a oval baking dish to contain the Stew Beef that consists of chunky pieces of perfectly braised beef shin, celery, carrot and potato, it was served pipping hot. It has been slow-cooked for 8 hours till it is fork-tender and with a rather thick and strong-flavored gravy. This is no doubt one of the better Beef Stews that i have eaten in Singapore so far. 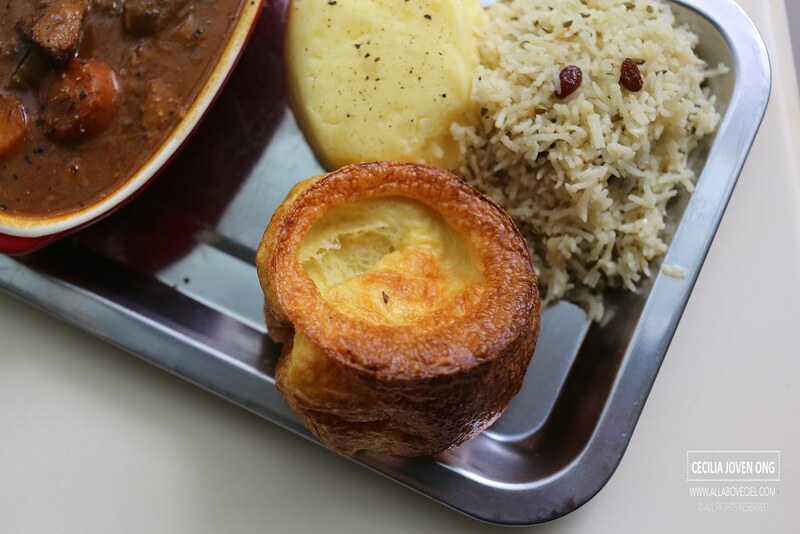 The Yorkshire Pudding is a traditional English dish that is made from batter consisting of eggs, flour with milk or water and it is usually served with beef and gravy, or served as a dessert. The one served here has puffed up beautifully, not too greasy but with a crusty outer layer and is still moist and light right within. The texture of Hand-mashed Potato is smooth and slightly coarsened and garnished with a dash of black pepper to enhance its flavor and it makes a perfect pair with the gravy from the Beef Stew. The Fragrant Rice has somewhat reminded me of the indian style rice that is cooked for their biryani which i did not quite enjoy but my lunch companion thought it was good. There are 2 desserts on the menu, the butter poundcake with custard or pudding with ice-cream and maple syrup at $3 each.